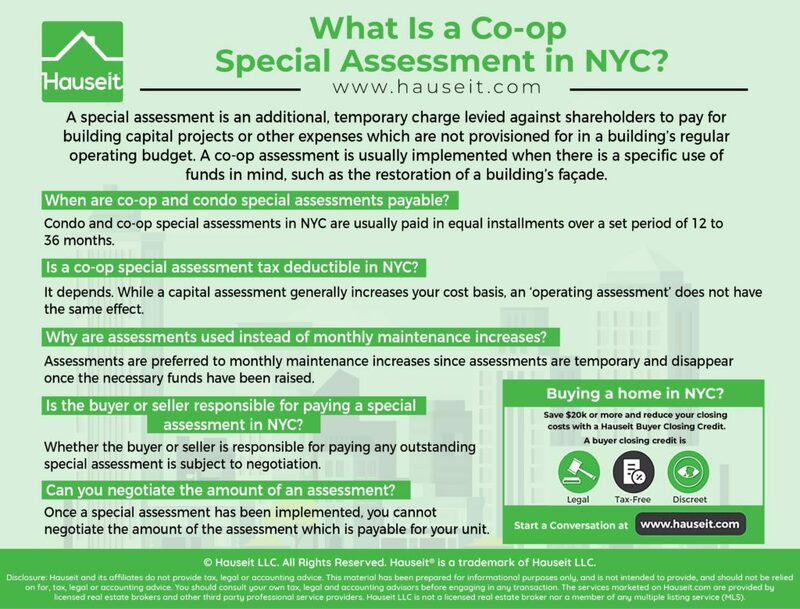 What is a co-op special assessment in NYC? Are assessments tax-deductible? Is the buyer or seller responsible for paying current assessments? Are assessments negotiable? 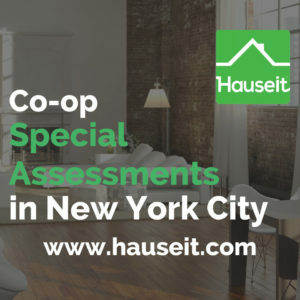 In this article, we explain everything you need to know about co-op special assessments in NYC. What are co-op assessments used for? When are co-op and condo special assessments payable? 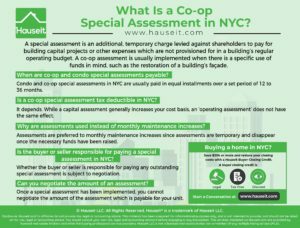 Is a co-op special assessment tax deductible in NYC? Why are assessments used instead of monthly maintenance increases? Is the buyer or seller responsible for paying a special assessment in NYC? Can you negotiate the amount of an assessment? What is a co-op tax abatement assessment? A special assessment is an additional, temporary charge levied against shareholders to pay for building capital projects or other expenses which are not provisioned for in a building’s regular operating budget. A co-op assessment is usually implemented when there is a specific use of funds in mind, such as the restoration of a building’s façade. The cost of a special assessment is typically allocated to unit owners based on the number of shares owned. Assessments are usually payable in installments over a set period of time, although it’s possible that a co-op may levy an assessment which is payable in a lump sum or an assessment which is ongoing and has no specified ending date. During the time of the assessment, a co-op shareholder makes two monthly payments: the regular monthly maintenance bill and the assessment payment. Assessments are generally preferable to maintenance increases since the latter are permanent increases which, over time, can decrease the value of the apartments relative to those in neighboring buildings with lower carrying costs. Assessments are typically used to raise necessary funds for a specific and costly building improvement project. The most common reasons for assessments include repairs to expensive building components including the façade, roof, elevator and heating systems. Assessments can also be implemented to pay for aesthetic building upgrades including a lobby renovation, hallway re-carpeting, installation of a roof deck or any other project deemed worthwhile by the co-op building. As a co-op shareholder, you can advocate for and against various proposed improvements other repairs which may be under consideration by your building. Special assessments can be further subdivided into capital assessments and operating assessments. The proceeds of capital assessments are used to make long-term repairs and upgrades to a building, while ‘operating assessments’ are used to fund the ongoing operation of a building. Condo and co-op special assessments in NYC are usually paid in equal installments over a set period of 12 to 36 months. However, a co-op or condo building may elect to bill the per-apartment assessment as a lump sum payable immediately. The specific amount and payment structure of a special assessment is determined by the co-op or condo building. A lump-sum assessment is more common if urgent and costly repair work is required immediately and the building does not have enough cash available in their reserve fund to pay for the repairs. To prevent these sorts of situations, co-op and condo buildings in NYC may establish a line of credit, take out a mortgage or implement an assessment specifically to build the reserve fund over a set period of time. A building may also establish an assessment in order to raise money for a legal fund or to pay down some or all of the building’s existing debt. It depends. While a capital assessment generally increases your cost basis (reducing your tax bill when it comes time to sell), an ‘operating assessment’ does not have the same effect. Whenever your building implements an assessment, we suggest that you save all of the related documentation and bills. Your accountant will be able to advise you as to which assessments and other bills you’ve paid over the course of ownership will qualify as an increase to your apartment’s cost basis. Pro Tip: Confused about taxes in NYC? Read our comprehensive NYC Real Estate Taxes Overview and Guide. Assessments are preferred to monthly maintenance increases since assessments are temporary and disappear once the necessary funds have been raised. Maintenance increases, on the other hand, are permanent and can add up over time. If a building mismanages its finances and ends up having higher-than-average apartment maintenance bills, it can destroy your resale value when you decide to sell. Before buying an apartment in NYC, we recommend that you have your buyer’s agent request the apartment’s most recent 5 year monthly maintenance history. Requesting this information can help you determine whether the building has a history of large, annual percentage increases in monthly maintenance. High carrying costs and buyer/seller closing costs can erode your equity over time, so it’s important to make sure that the building you are buying into has a history of being financially responsible. Whether the buyer or seller is responsible for paying any outstanding special assessment is subject to negotiation. If a listing is very competitive and there are multiple offers, asking the seller to cover any assessment will likely be a non-starter. On the other hand, a seller may be willing to pay some or all of an assessment is the property has been floundering on the market for six months or more. The sale contract will specify who is responsible for paying any identified and ongoing special assessments. If a new assessment is implemented after the contract has been signed but before closing, the buyer is typically responsible for any assessment payments payable on or after the closing date. As part of your attorney’s pre-contract due diligence procedure, he or she will review the building minutes and financial statements to see if there is any hint of a contemplated assessment in the near future. Once a special assessment has been implemented, you cannot negotiate the amount of the assessment which is payable for your unit. Failing to pay any assessments could land you in legal hot water with the building, as they may respond to non-payment by enacting fines and ultimately going after your ownership stake in the apartment. If you are buying an apartment which has a current assessment, this is something you can negotiate with the seller. However, asking the seller to pay for a current assessment has to make sense in the context of the market demand for the listing. If there is a bidding war and you ask the seller to pay for an assessment, the seller probably won’t take you or your offer seriously. A co-op tax abatement assessment is used by co-ops as a way to capture the ‘Cooperative and Condominium Tax Abatement’ amount paid by the NYC Department of Finance to owners in NYC who use an apartment as their primary residences. It’s quite common in NYC for co-ops to levy an assessment equal to the amount of the tax abatement being paid by New York City. Implementing a tax abatement assessment is an easy way for a co-op building to fortify its finances without having to raise monthly maintenance. Furthermore, a tax abatement assessment is less painful to shareholders since they don’t ever see the money which is being used to pay the assessment. A co-op tax abatement assessment is also used as a strategy to increase a unit owner’s cost basis, thereby reducing any capital gains tax payable when selling. Special assessments are usually added to your apartment’s cost basis over time.